"Traditionally", the entourage is asked to wear, what I personally call, "entourage gown uniforms" reminiscent of debuts or cotillions. 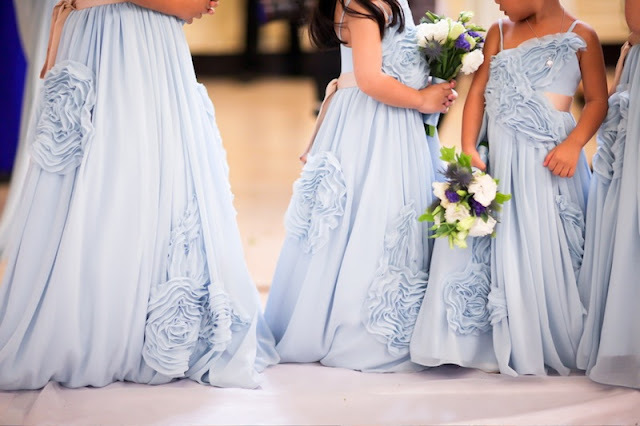 The gowns are usually of the same color or palette, of the same fabric, and varied only by styles which can range from haltered, tube, off-shoulder, etc, etc. While there's nothing wrong with this, my advice is to be more adventurous about it, create a more fashionable theme the likes of a runway collection, so that your entourage will REALLY have fun with it! Designer Hindy Weber Tantoco is fast becoming a favorite for entourage collections. And rightfully so, as she has been known to be versatile, being the brain child of Rustan's U and U-Swim (for teens), Culte Femme (for women), Belle Mama (for expecting moms), and Kiddos (for kids). With 10 years in the retail biz, hers is an experience unparalleled by no other. In fact, she's had brides who have asked her to create an entire line of wedding collection, which includes gowns, resorts wear, and even swimsuits! Hindy's entourage collections are so inspired, it's like she just collaborated with the bride to host a fashion show during the ceremony! Hindy shares with us some inspirations for themed entourage collections. Pantsuits and an entire fashion collection complete with accessories! How fab! Wonderful flowing dresses, and resort wear! The obvious choice is to use this theme for a destination wedding--but bring the theme in Manila to make it even more abruptive! Which entourage theme are you inspired with? Let us know! Love it!! Thank you so much, Kai! Love the blog layout, graphics, tone!! Galing! !